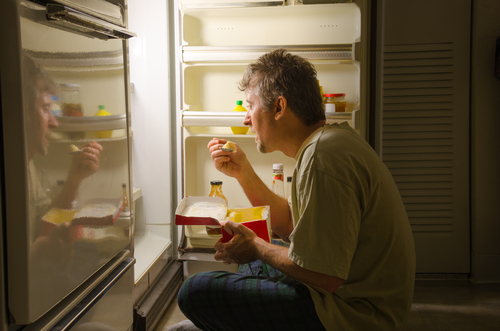 Does Late Night Eating Ruin Your Rest? For the most part, conventional wisdom emphasizes one very important thing when it comes to food and sleep: don't mix the two together. However, this can be a pretty big challenge for a lot of people. More often than not, the leisurely activities you do in the evening will revolve around food. Avoiding the temptation to indulge can be close to impossible. And if you're that constant party pooper who doesn't want to have late dinners with your friends, you may face getting ostracized. So most people choose to accept the consequences of poor sleep instead of rocking the boat. But this may be a very unwise decision. Sleep is basically the foundation of good (or poor) health. And we're not just talking about whether or not you feel tired and groggy after tossing and turning the night before. There are scientific studies now which prove a direct connection between eating before bed and things such as weight gain and premature aging. If you're concerned about any of these - which most people are - then you should definitely stay put and read the rest of this article. We'll help explain exactly why eating at night is so bad for you, and what you may want to do instead. Not many people spend a lot of time thinking about the health of their adrenal glands. However, that may change in the very near future. Medical experts have been doing a lot of research on these little organs, and their impact on our overall health and wellness is more substantial than we've previously known. The adrenal glands are located on top of your kidneys and can easily become stressed out depending on things like sleep quality, excess caffeine intake, and more. When the adrenal glands are stressed out for a prolonged amount of time, you may develop a condition known as "adrenal fatigue". Early stages of adrenal fatigue can manifest symptoms such as lethargy, weight gain, dark circles under your eyes, and skin aging. If you don't change your health habits for the better, it can get worse over time and eventually become something called secondary hypothyroidism. Your thyroid gland and your adrenals are like best friends; they work closely with each other on many different physiological processes that happen in your body. But if they aren't functioning optimally, this can have a secondary effect which slows down your thyroid, too. But because this is so often misdiagnosed as primary hypothyroidism, you may end up getting medical treatment or taking medications which do more harm than good to your body. People have linked inflammation to all sorts of diseases, especially autoimmune diseases. In a way, it makes sense. After all, the word inflammation is just a short way of saying that your immune system is constantly working in overdrive. And if your immune system is constantly on high alert looking for pathogens to destroy, your body may start attacking itself instead. But if you make sure there's a good space of time between eating your final meal of the day and your head hitting the pillow, you can help reduce the amount of inflammation in your body. Autophagy is something that happens when your body experiences small to moderate amounts of stress. It is usually triggered by physical stress, like exercise, a hot sauna, or fasting (going without food for an extended period of time). When your body enters autophagy, it breaks down and recycles old cells so that it can create newer, healthier ones and repair damaged tissues. Autophagy is something you definitely want to have happening in your body as often as possible if you want to look young and feel healthy for as many years as possible. But in order to trigger autophagy, you have to push yourself out of your comfort zone to a certain degree. Part of that, obviously, includes giving your body a longer fasting window throughout the day. But you can't exactly do that if you are eating food from the moment you wake up in the morning to mere minutes before you go to bed at night. We know, we know, it feels absolutely miserable to go to bed hungry. But you get so many wonderful benefits in return - like firmer, younger-looking skin, more energy during the day, and a better mood, too - that we think it can help give you a little bit of motivation. Obviously, the first step is to make sure and create a two to three hour buffer between your final evening meal and your bedtime. However, this may still be difficult for a lot of people. Thankfully, you can kill two birds with one stone by taking a melatonin infused natural sleep aid before bed. Not only can it help you fall asleep sooner and stay asleep longer, but it can help reduce the damage caused by the late night feeding. Taking a natural sleep aid with melatonin is especially important because it has an inverse relationship to cortisol. Cortisol lowers your melatonin levels, and vice versa. So if you put more melatonin in your body, it will help it flush out the cortisol that is making you feel anxious and restless at night. That way, you can get the restorative rest you need to wake up bright-eyed and bushy-tailed the next morning.